There is more information available on this subject at Tsavo on the English Wikipedia. Were you looking for Tsavo Highway, the Halo 3 Level? Covenant forces above the Excession. Tsavo is a region in Kenya in the East African Protectorate in Africa on Earth. Tsavo is located 168 kilometers from Mombasa, and about 26 km north of Voi, Kenya. Tsavo is also a railway crossing for the Uganda railway over the Tsavo River, which comes down from Mount Kilimanjaro. The river in the north goes all the way to the coast, around a hundred kilometers north of Mombasa. The Tsavo Highway, also known as A23, links the towns of Voi and Taveta, as well as towns such as Arusha beyond the Tanzanian border. There are also checkpoints such as Checkpoint 4 and Checkpoint 8 along the highway. The highway terminates at the town of Voi, at the Nairobi-Mombasa highway. The Global Water Campaign's GWC Trans-African Pipelines travel along the highway, carrying water to the entire continent. By the 26th century, a large artificial ocean inlet had been built south of Tsavo, on the edge Voi, to transport cargo from the industrial facilities in the region all the way to Mombasa and the Indian Ocean. Tsavo also housed a large national park, the largest nature reserve east of Nairobi. When the New Mombasa Orbital Elevator collapsed during the Battle of Mombasa, debris from the elevator rained down many kilometers south of the Tsavo region. During the Battle of Tsavo, John-117 traveled across Tsavo Highway, heading north-east towards Voi. While traveling along the highway, Spartan-117 found it to be grievously damaged, with several parts on the verge of collapse. The reservoir had been excavated revealing the Portal to the Ark. UNSC and Covenant forces were scattered over Tsavo Highway following the evacuation of Crow's Nest; most were rounded up or killed by John-117. 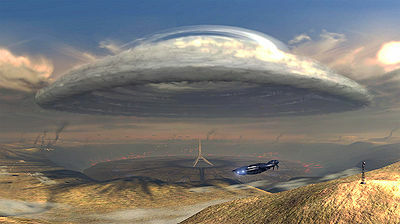 Concept art of Tsavo in Halo 3. Concept art of Tsavo's landscape. A section of the Tsavo Highway. The broken Highway, with New Mombasa's orbital elevator scattered across the hills. Voi Municipal Water Pump House 03. An outpost near the Voi pump house.